From my understanding from my work, differential speed limits are usually related to signalling (although there are other cases such as tilting trains on the WCML and some structures). Generally they exist to allow a stock type to use a line for which the signalling has not been designed, or to get a bit more of an advantage out of rolling stock which has better performance than the current system. My experience of working on projects with multiple signalling systems is that differential speeds tend to be far more common in areas with 4 aspect signalling than 2 aspect or absolute block signalling. Traditionally a line's signalling is designed with the braking distance of the slowest braking rolling stock in mind, which usually will be freight. However on busy commuter lines, such as the Brighton Mainline (BML) freight is relatively rare and designing the signalling to accommodate freight would comprise the headway of the line for little to no benefit. Therefore to enable freight to use the route a differential speed limit is created (BML uses the 2/3rds rule which states that freight trains are permitted at 2/3rd of the linespeed except where a specific differential speed limit applies). This speed limit will be calculated such that the slowest braking speed for any permitted freight consist will allow it to stop within 1 or two signalling sections (depending on the number of aspects that signalling system uses). The opposite can also be true. In some cases a train may have a slightly better braking characteristics then the rolling stock that the signalling was designed for. As such certain stock types (usually multiple units or HSTs) can be permitted at a speed limit higher than line speed (normally only 10 - 15 Mph higher) in order to achieve slightly improved journey times. Such speed profiles were commonly introduced by BR in the 1980s when HSTs and Sprinter DMUs began operating on lines previously worked by loco hauled trains. In this case it was not economical to upgrade the signalling for the new rolling stock, but journey time improvements could be made by increasing the speed limits for the new stock to operate within the existing system. It is possible that some features of the Permanent Way will require a differential speed profile, however from my experience this is not usually due to track curvature and more to do with weak structures. Freight trains exert considerable dynamic loads when travelling at high speeds and as such may be slowed to reduce the wear on certain structures on a route. 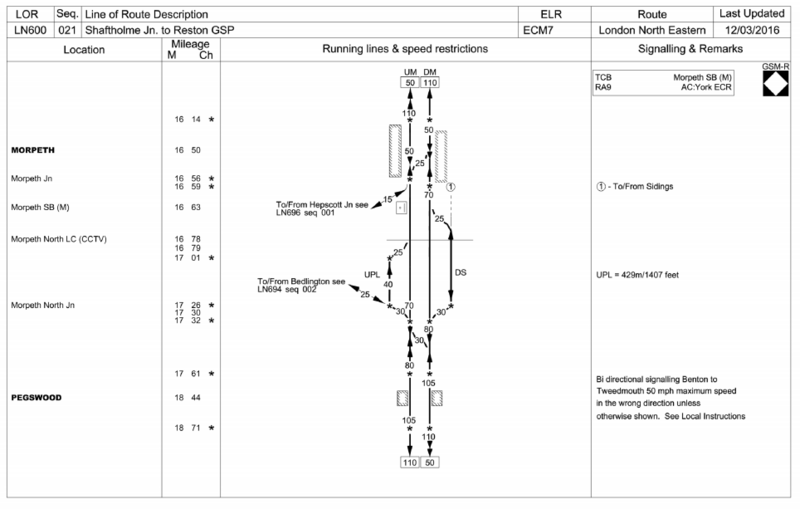 For example this extract from the National Electronic Sectional Appendix (this is available publicly by the way) shows the famous Morpeth curve at the top of diagram where the speed limit changes from 110 Mph to 50 Mph. Despite this being one of the sharpest corners on a mainline in the UK there is no differential speed limit as the signalling system can accommodate freight trains at line-speed. From an in game perspective a lot of this should be represented by the signalling modelled in the game, however a useful feature could be to allow the player to chose a line-speed for a section of line. Often when express trains arrive into termni in cities it could be useful to restrict them to the speed of local trains to prevent them catching up too quickly and therefore constantly stopping and starting when they catch up with a slower train, the same can be true of freight trains when they are behind a stopping service, a lower speed limit for freight could reduce the need for them need to stop completely. Taking this quote from another topic which I started a couple months ago. I've been looking at this reply that James got from SuperTimo and I found this very interesting. Because, I directly think that like higher permissive speed limit tracks should be a feature on Simutrans Extended and that weight/tilt restricted tracks should feature in-game to give people an option of running loco-hauled passenger or freight trains without the need to use track with a higher max, speed. Signals have speed limit that should be relevant to their visibility (e.g. dwarf, classic, cab signals). # This setting allows the way in which weight limits are enforced to be customised. # 0: weight limits are ignored entirely. # 1: then vehicles can travel over roads, rails, tunnels and bridges for which they are too heavy, but only at greatly reduced speed. # 2: Vehicles cannot travel over ways for which they are overweight at all. # 3: Vehciles cannot travel over ways for which they are more than 10% overweight at all, and will travel on ways for which they are up to 10% overweight at a greatly reduced speed. Although I don't know what exactly is the "greatly reduced speed". And we have tilting trains, that can pass curves 30% faster faster. And what is in real world (Czech railways). 4. cargo trains - lower speed limit only on some places, specially mentioned in track info. Out of those, we have #1 already implemented. #2 and #3 could be made as generalization of #1. Instead of binary value (tilting or not), could be a % that says how much faster or slower this train can go through corners. #4 is imho for places where train weight matters like old bridges that do not match the axle load of the rest of the track. This is possible with setting enforce_weight_limits=1. So far none of these are relevant to signalling - only to track geometry (curves), axle load, and train characteristics. All distant signals and 3-aspect signals are built at this distance from next signal. If a train is not capable to break at this distance, it must reduce its speed accordingly. This is partially done in simutrans too. If you put the distant signal too close to the main signal (or not at all), trains will start braking earlier even if the signal is clear. Moreover, trains without cab signalling are limited to 120 km/h. So it seems that the 1 km distance is not enough for higher speeds, and cab-signalling gives you one more block (1 km) to brake. Of course trains do not have to start braking immediately after passing caution signal. The driver has to know how much he needs with given train. (That is also implemented in simutrans). 4-aspect signalling was used to increase capacity by using blocks shorter than braking distance (cca 1970-2010), now it is used only in stations, when you need shorter blocks due to track layout. Again 4-aspect signaling works well in simutrans. So I think simutrans-extended has all this covered quite well. What exactly are you missing? I am just trying to explain how like there are tracks which is limited for certain trains (i.e. on the Chiltern mainline) where past High Wycombe, there is 1 55/85mph limit the 55mph limit applying to freight trains and the 85mph limit applying to passenger trains (including those loco-hauled). So, in simple terms. I'm asking for a bit of track variation within the game as like there are also lines which have speed limits for heavier trains (i.e the Middlesbrough line) where there are speed limits which apply to the class 185s which are slower due to there weight and faster speed limits which apply to sprinter trains. As I said above, would not that be the case for enforce_weight_limits=1 or 3 ? Yeah, thats the issue you see and I want to run loco hauled pass. trains but with the weight restrictions it seems impossible as they will run slowly. The 55/85 differential limit is due to different braking rates - the line mostly uses 3-aspect signalling which wouldn't allow (many) freight trains enough time to stop safely after encountering a yellow 'caution' signal. That line also has some locations where the speed limit differs for variants of the same class of DMU, depending on whether it has end gangway doors or not, due to door restricting visibility of signals in certain locations. The way that Simutrans (Extended) handles this sort of speed restriction is different to how it is handled in reality. Firstly, Simutrans estimates the braking rate of a train and uses that to work out how fast it can go through a signal. This is a much more precise restriction than in reality, and allows each train to effectively have a different speed limit. Secondly, the speed limits in reality are generally chosen to be speeds at which trains can drive continuously without having to slow down until a restrictive signal aspect is seen. On the other hand, in Simutrans trains will quite happily run faster than this between signals, but will then brake on approach to signals until the driver can see that it has a clear aspect, at which point they will accelerate again. This behaviour is probably easier to program an use, but woudn't be applied in reality because it would have a significant detrimental effect on energy consumption. (i.e the Middlesbrough line) where there are speed limits which apply to the class 185s which are slower due to there weight and faster speed limits which apply to sprinter trains. Oops, I think I made a mistake with what line it was. It was the Scarborough line btw. That is quite long video. What part is interesting? As said before, if the limit is due to braking, then that means that the blocks are too short, and simutrans will already make the trains run slower (break earlier than at the signal). And that should force you to fix the signalling - either use 4-aspects, or make longer blocks. Also in real world, when train is assembled, its weight and braking capabilities must be calculated and compared with the tracks requirements - steepness of downhill parts and block length (or distance of distant signals), and the top speed might be limited if necessary. That is done by simutrans automatically, as if the driver always knows where the main signal is and know when to start braking. This is interesting topic and made me study more about railways. In CZ freight trains are generally limited to 100 km/h - this can be enforced in the dat file for wagons. Only some can go 120 km/h when loaded, some others can go 120 km/h only empty. Every freight wagon has a table stating how much you can load it (at 100 or 120 km/h) in order not to go over the allowed axle load for given class of track. A = 16 t/axle; B = 18 t/axle; C = 20 t/axle; This makes it quite complicated. Part of that would be nice to have in simutrans. If the track (or road in general) to the destination is weak to support fully loaded vehicles, load them only partially so that they can pass. That would be nice addition to enforce_weight limits. Also tracks support different axle loads at different speeds. As the freight trains are limited to 100 km/h, the weight limits usually apply to this speed. Passenger trains are usually lighter (and break faster) so they may go faster. For example, Concrete sleepers B03 (252 kg) with rails S49 (49 kg/m) support 22.5 t/axle at 120 km/h but only 18 t/axle at 160 km/h. It might be nice to be able to specify set of weight/speed parameters for single way type. - instead of tilting 0/1, have a % how faster or slower can given train go in curves than "normal train"
However I do not see these as really fundamental problem. I mean ideally, I want there to be a feature where you as the player can set the speed limit of that line (track) so that in certain places. You can set the speed limit to a lower speed limit for certain places (i.e. terminus stations). But, I do understand where you are coming from. It is not clear what advantage that there would be to a player in setting a speed limit on a piece of railway line: a player always has an incentive to allow trains to travel as fast as possible. In reality, people who run railways set speed limits because, without them, the trains might crash because they cannot stop for signals in time, derail on corners or at least the passengers might be thrown around inside the trains travelling too fast around corners; however, we do not simulate any of those things in Simutrans, so the speed limits need to be imposed automatically to simulate what sensible people running a railway would do in reality to ensure safe operation. The imposition of speed limits by players is a different topic to the issue of differential speed limits which I believe is where this topic began. Differential speed limits, as I understand it, are used where different types of rolling stock have different characteristics which allow them to travel safely at a higher speed over certain stretches of line, such as the ability of tilting trains to take corners more quickly or the ability of trains with better brakes to stop in time for signals spaced more closely together. In Simutrans-Extended these attributes are simulated, not by a fixed speed limit imposed on a section of track, but by a dynamically calculated speed limit for corners and dynamically calculated braking distances for signals. This gives the closest conformity to the modelling of the economic effect of various features of railway operation (such as signal spacing, curve radii, tilting mechanisms, braking capabilities and so forth) with the minimum of complexity both to code and to interact with for the player. The thing to remember is that the speed limit for a particular type of track is not intended to be a representation of the line speed limit of an actual piece of railway line: it is intended only to be a representation of the fastest line speed limit that that type of track will allow. The actual line speeds are calculated dynamically taking into account all relevant features. Remember, the goal of Simutrans-Extended is to be an economic simulation, not a computerised model railway. Operational details that have minimal economic impact and which would be complicated to simulate (e.g. the fact that, in reality, speed limits are calculated by engineers when the line is constructed rather than calculated dynamically by each passing train) are generally not represented. Thinking about all of this now, I was more thinking of being able to set speed limits, for it to be that like you can set low speed limits (i.e. 25mph (40km/h) on the approach to terminus stations and higher speeds (i.e. 125mph (200km/h)) on fast lines as such as opposed to making every single track being able to handle heavy locomotives. Do you simply mean to suggest that there ought to be lower cost track with a lower speed limit but high weight limit available? Yes, in more simpler and in more thoughtful terms. I was originally focusing on making every track being able to handle heavy trains. That might be worthwhile - do you have any data relating to low speed track capable of carrying heavier rolling stock? In terms of data, I have looked up such data, but could not find any proper info. to suggest this, but however in terms of lines which carry heavy rolling stock the GOBLIN and the North London Line carries heavy freight as well as the West London Line with the latter line having a max. speed of 60mph (97km/h). Although should a type be made, I would personally make the line have a max speed of 70mph (112km/h) to allow for better timings for passenger trains. Do we know whether the GOBLIN's restrictions are due to the quality of track itself or the curvature of the route? Or a third possibility - due to the signal spacing and different braking rates. Yes, indeed. Does anyone have any data on the relationship between the track itself and speed limits, controlling for such other factors? Both of those points do really interlink with eachover as I've travelled on the line and the track quality in areas isn't the best and the line has quite alot of curves which makes it for a curvy ride. Do you or does anyone else have any data on the relationship between the track itself and speed limits (data, that is, as opposed to a general impression, as I cannot get figures from a general impression)? Unfortunally after researching for a while for any data online, no. No data is available James.